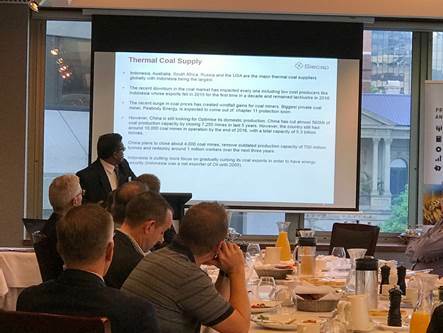 Leading project management and advisory firm Siecap hosted a mining industry CEOs breakfast forum at the Brisbane Club last Friday 24th March. Senior executives from the resources sector came together at the event to hear insights into the future direction of the industry. Siecap Advisory Board Member Tim Crossley acted as MC and opened the forum by sharing highlights from his recent trip to Toronto, where he attended the Prospectors and Developers Association of Canada (PDAC) conference. An Australasian resources industry expert, Mr. Crossley noted that the atmosphere at the event was significantly more upbeat than the previous year. “An appetite to start funding exploration and even Greenfields exploration for the right commodities seems to have returned to the sector. I can sense that we have gone through a 12-24 month phase where private equity and counter cyclical buyers have been cherry picking advanced exploration projects, and now early stage exploration is being looked at”, he said. Siecap Director of Consulting, Manish Garg also spoke at the breakfast forum, presenting on global coal outlook. As a respected member of the resource consulting community with over 25 years’ experience in mining, metallurgy and commercial management, Manish was well qualified to address the implications of these international trends on the Australian market. His presentation detailed global thermal coal trends in price, supply and demand; Asian power growth, import and consumption projections, and an Australian exports and price forecast. “In Siecap’s opinion, short term thermal coal price is expected to be at $75/t-$80/t, which will be stabilised to $70-$75/t in medium to long term. There will be significant M&A activity and recommissioning of latent capacity is anticipated”, Manish explained. Attendees had the opportunity to direct questions to the two speakers, and vigorously discussed the presentations at the conclusion of the forum. For further information, or to register for future events, please contact e.chalker@siecap.com.au. Siecap is a project management and advisory firm providing customised solutions across the resources, infrastructure, agribusiness, supply chain, logistics and procurement industries.